The adjective ‘sumptuous’ might have been made for The Milestone Hotel. 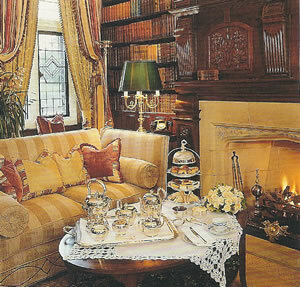 The word suggests plump cushions, curtains of heavy silk brocade, exquisite porcelain reflected in surfaces of polished mahogany, oil paintings in gilt frames, thick carpets of warm colours and strategically placed table lamps of the finest and most expensive sort. And here they all are, in two grand Kensington houses of the 1880s, as English as English can be, combining to offer visitors to London an exclusive haven of privacy and luxury in one of the very best parts of town. When the Royce and I pulled up outside The Milestone, we both had smiles upon our faces. The Milestone has been an hotel since the 1920s. Then it was called The Cheneston, after the original pronunciation of Kensington. 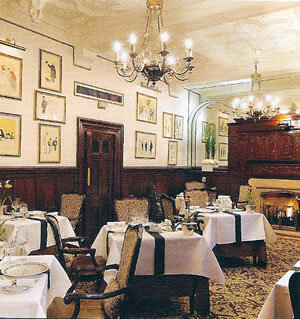 (The word is preserved today in the name of The Milestone’s restaurant.) In those days, one of its visitors was the Reverend Harold Davidson, the infamous Rector of Stiffkey, who spent his weekdays with the street girls of London and who ended his days in the cage of a lion at the amusement park in Skegness. Mr Davidson would, doubtless, still recognise the exterior of the building, but the richness of the interior might be a shock to his system. As soon as I walked through the entrance doors, the staff began to use my surname. This small courtesy continued until my departure. It made me feel at home, without in any way endangering the correct formality of the service. Indeed, I was struck throughout my visit by the high standard of care everyone was striving to achieve. Members of staff were numerous, smart and well motivated. I congratulate the General Manager, Andrew Pike, on his team. There are only 57 rooms at The Milestone. Mine was on the fifth floor. 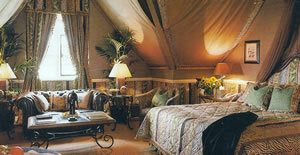 Room 506 was the ‘Safari Suite’ (a junior suite and therefore £670 - £717 a night for two). You might be able to guess the decorative theme I found in this spacious, air-conditioned apartment (pictured). African works of art were all around. The ceilings were draped with material, to create the effect of being in a tent. The engravings were of wild animals – here a lion, there a giraffe. The bedspread and the upholstery of the easy chairs imitated the skins of leopards. On the coffee table were picture books about the rivers of Botswana. Even the lining paper in the desk drawers boasted a zebra pattern. Surrounded by the leaves of potted plants, I fancied for a fleeting moment that I might be a hunter of big game. 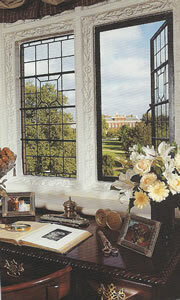 But the view of Kensington Palace from my window destroyed that very un-‘pc’ thought. So did all those thoughtful items provided for my comfort and convenience: the six table lamps, the leather chesterfield, the ceiling fan and, on my desk, the cellotape, the stapler and the paper clips. In my fitted wardrobe I even found an iron and an ironing board – that useful pair which comes as standard in the States, but which is rarely found in the hotel rooms of England. In the modestly sized bathroom of beige marble, the generosity of provision continued, with lots of fluffy towels, brilliant white under the spotlights. After this pleasing indulgence, I needed some modest exercise. 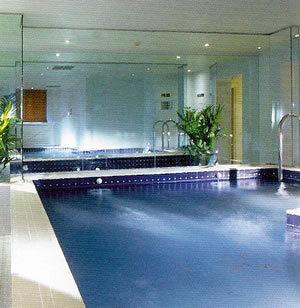 I could have plunged into the pool at the hotel’s Health Club, but I must be careful not to overdo the physical jerks. Instead, I walked slowly up to the Albert Memorial and the Albert Hall, found a bench in Kensington Gardens and marvelled yet again at the romanticism and the confidence of the Victorians. Then a shower threatened, so I scurried back to the warm embrace of The Milestone, to prepare for dinner. 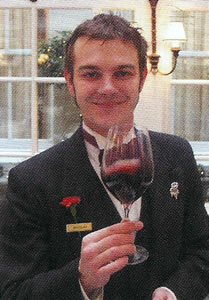 It is my custom, when dining at the hotel in which I am staying, to have the wine list sent to my room. I remembered, from my last visit to Cheneston’s Restaurant a few years ago, that the cellar had been rather modest. I was therefore delighted by the document which awaited my return. Delighted, but not really surprised – for I knew that Nicolas Clerc (pictured) had just won the Champagne Ruinart Sommelier of the Year competition. Here for my perusal, then, was the list of a real enthusiast, containing over four hundred interesting offerings. If I tell you that it contained 15 German dry white wines (when, even in decent restaurants in this country, you are lucky to find more than one), you will have a sense of the list’s quality. Prices run from £18 for a white from Georgia to £1,800 for the 1995 Pétrus. Some of the clarets look like bargains – like 1985 Palmer for £175 and 1996 Lynch Bages for £150. Here are some of the other bottles which caught my eye, from France, Italy, Australia and California: 1995 Le Montrachet, Lafon (£1,700), 1995 La Tâche (£880), 1961 Montrose (£1,600), 1988 Cheval Blanc (£420), 1997 Sassicaia (£280), 1999 Henschke Hill of Grace (£275), 1993 Harlan Estate cabernet (£900) and 1995 Dominus (£170). This reading increased my sense of anticipation, and I went down for dinner after dressing hurriedly (although, as always, carefully). Two cushions having been supplied by the charming and attentive Assistant Restaurant Manager, Gerhard Van Rooyen, to ensure the comfort of my back, I looked around the small dining room from my table by the window. 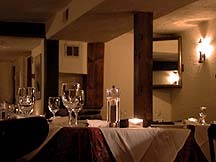 Its low lighting, white tablecloths, candles and Schott glassware were all to my taste, as was the discreet service from waiters in dark waistcoats. 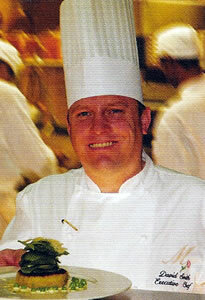 Chef David Smith (pictured) offers a menu which mixes the tried and tested with dishes of a more adventurous kind. This seems entirely right in this context. Good quality ingredients, expert cooking and careful presentation ensured that my meal was highly enjoyable. 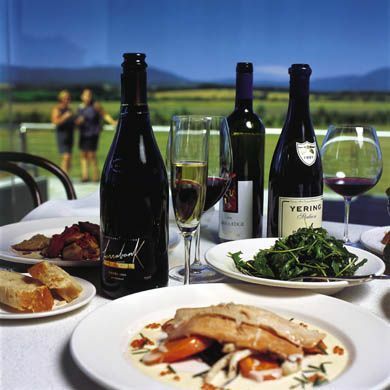 A seven course tasting menu is offered for £60, or £95 with matched wines. I chose four courses from the carte for £68. I began with smoked salmon, carved by the table. The Irish was darker than the Scottish, and I slightly preferred its more robust flavour, although both were properly meaty. The usual accompaniments (capers and chopped onion, egg white and egg yolk) were served in little bowls. A warm salad of peppered tiger prawns, flambéed with ginger and Pernod, then offered more exotic tastes, but it was back to old-fashioned British fare with braised fillet of Welsh lamb. This was a lovely piece of meat, tender and full of earthy delights. My concluding raspberry and mango soufflé with ginger ice cream was as good as it sounds. My time studying the wine list paid high dividends. I began with a glass of Bollinger 1999 (£20), elegant and creamy. Then it was a bottle of dry riesling by one of my favourite producers, Hermann Dönnhoff (Riesling Spätlese, Schlossbockelheimer, Felsenberg, Nahe, 2002 - £52). With petrol in the nose, apples and pears in the mouth and only 8•5% alcohol, this was glorious drinking, and went particularly well with the prawns. With the lamb, I thought I could not go wrong with an older claret from Margaux. The 1988 Chateau Giscours (£95) was complex in the nose and promised much, but a lot of its fruit had gone, so it yielded less in the mouth than I had hoped. It was back to Germany and the Nahe for the pudding wine, a joyous balance of sweetness and acidity with just 8% alcohol (Riesling Auslese, Göttelmann, Munsterer-Rheinberg, 2004 - £54, 50ml). I really do love these German wines when they are so good. The following morning it was back to the same table, now covered with a cloth of bright green check. Here a friendly lady from the Philippines, Nieves, brought me a splendid plate of smoked haddock and mushrooms, and I secured from the buffet Corn Flakes, blueberry muffins, fruit salad and compote of red berries. As usual, I lingered over breakfast and felt the better for my lingering. I felt better for my stay, too. The Milestone is, without doubt, one of the loveliest hotels in London. What word best describes it? Sumptuous, I think. 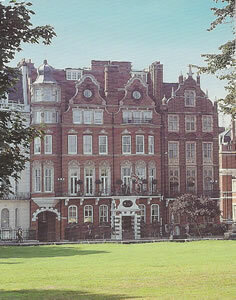 1-2 Kensington Court, London W8 5DL, England.